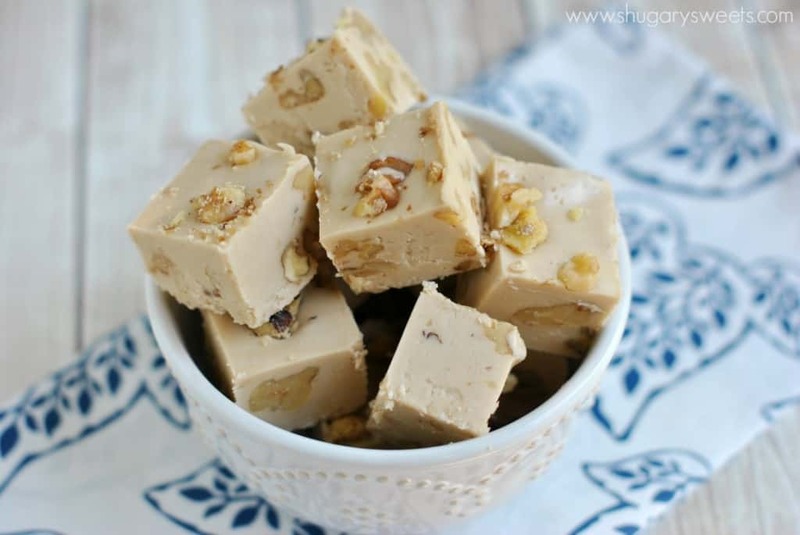 One of the most requested fudge recipes is finally here: Maple Walnut Fudge. It’s so good, I’m glad I caved and made some for you all! Now that we are back in Illinois, we’ve been on the search for our Church home. Visiting churches with the kids and rating them on music, service, sermon and overall feeling. Okay. Fine. I didn’t actually say that. Aloud. But I was waiting to hear it from the congregation. How cool would that have been? Haha!! Actually, the common answer, duh, was church cookbooks. Yeah, I get many of my recipes from there too! I thought it would be a sign from heaven though if someone had shouted Shugary Sweets. Or even food blogs for that matter. But, the sermon went on, the music played, and we loved the service! Now I can’t wait for the first church function that involves food…I need a new crowd to enjoy some delicious treats. 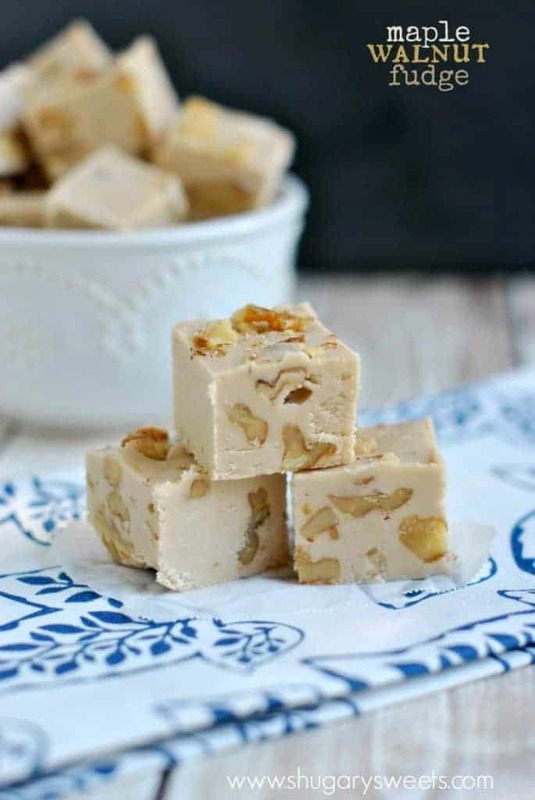 Maple Walnut Fudge is one of the most requested fudge recipes on the blog. 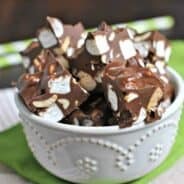 I’m constantly emailed and asked on facebook if I have a Maple Walnut Fudge recipe. Well, friends, the wait is over! It’s here It’s here!!! And just in time for the holidays too. This will be perfect on your dessert table. Forget cookie trays…start making candy trays. 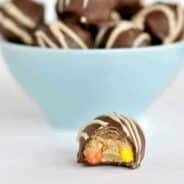 You’ll find lots of recipes here on Shugary Sweets to inspire you! And, the best part is most of the fudge recipes on the blog here can be made well in advance. Perfect for keeping on hand for those last minute visits! Not to mention I have plenty of fudge-making tips in my guide for how to make fudge. I’m sharing this recipe over on Food Fanatic today. As the candy contributor, I realize it’s time to share this classic fudge treat! ENJOY! Oh how fun! I just made a batch myself! So good! No holidays can be without this fudge! Pinned! Thanks for pinning Anna. It really is a great flavor combo!! I’m a huge fan of homemade fudge and you always have the best ones! This maple walnut fudge is no exception. I’m dying to try it! Can you tell me what brand of marshmallow creme you use? I think this is where my fudge attempts fail. Thanks, maple fudge is my husbands very favorite. I use Kraft Jet-Puffed marshmallow cream. Hope that helps! Half of my cookbook collection is made up of church cookbooks:) I just love trying new recipes out on my church family! How neat that you will have a whole new group of people to share the love with:) Maple walnut ice cream was one of my favorites growing up and I’m sure this fudge will be just as delicious. How cool would it of been if they yelled Shugary Sweets. I hope you guys end up liking this church and I’m jealous that they get to taste all of your yummy goodies. I so need to make another type of fudge. I always make chocolate and thats it. 🙂 Happy Weekend. Pinned! Right? It would have been cool for sure!! Thanks for pinning Cyndi! We love all things maple. Looks like a great combination, pinned! This flavour is fabulous friend!! LOVE! This is one of my favorite flavors! I’m so excited you made this! Love that YOU love this flavor!! I had to succumb to all the requests…and it was delicious! Finding a new church is SO hard! Glad you were able to find one you are happy with. And this fudge looks phenomenal! I think this gorgeous fudge was worth the wait. Seriously swooning over here! Thanks Sarah. I think it was worth the wait too…it’s very delicious! That would have definitely been a sign it was the right church if someone would have yelled that out. They probably saw you come in the door and were too embarrassed to yell it out 😉 I love finding old church cookbooks to look through…some of the best ones come from there! And this fudge does totally remind me of summers on the beach and all the fudge shops!!! This looks AWESOME! I love Maple Walnut Fudge. Pinned and shared on my FB. What brand of maple flavoring do you use ? I have Mapleine, is that the same thing?? Mine is kroger brand. It comes in a bottle like vanilla extract. I’ve never heard of Mapleine! Are the chips listed in the recipe actually white CHOCOLATE chips or white vanilla flavored chips? It seems that chocolate flavored chips would lessen the impact of the maple flavoring. Is the marshmallow cream really necessary? What about subbing to maple syrup?? In this recipe it is necessary to give it the soft, creamy texture. I am going to quit Pinterest if these annoying ads are not taken down. 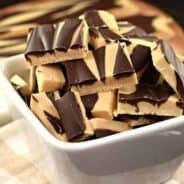 I thought people put recipes on here to share with others BUT I have tried 6 times to get this Maple Walnut Fudge & all that is readily available are ADS & comments. If the recipe is SO good WHY can’t we get it WITHOUT all the CRAPPY!!!! Advertisements!!!! This sounds delicious! So its going on my list to try!! I will comment after. Thanks for the wonderful recipes! I’ve never made fudge before, but this recipe just looked like a winner. And was it ever! Shared with my book club and then my bible study group and got so many raves! Made another batch for Christmas and got some more fans of this recipe. Thanks for sharing!! Hi, I’ve never made fudge before sooo this was my first. It came out really yummy but the maple flavor was not very noticeable. I used the amout indicated – the brand is McCormick real maple extract. Did I do something wrong? I have found that depending on the brand of extract and the brand of white chocolate, you will sometimes see this happening 🙁 Next time, i suggest you add more maple. Sometimes, people HATE when the maple over shadows a recipe, as it can be very intense. Thank you! I will try just a bit more maple extract next time and see how that works. ???? Have you ever made this recipe without the maple flavoring? Not a maple fan, and just want the white chocolate and walnut flavor. Thank you! Could I use marshmallow fluff instead of creme? Can evaporated milk be substituted for the heavy cream?